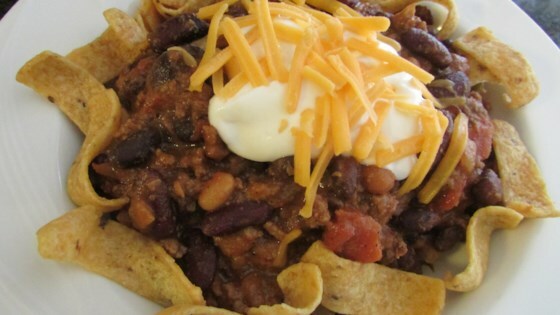 "This is my favorite chili and the only chili my kids will eat! Enjoy with crackers, corn bread, and ice cold beer." Combine kidney beans, chili beans, diced tomatoes, onion, and tomato paste in a large stockpot; cook and stir over low heat until onion is tender, about 10 minutes. Heat a large skillet over medium-high heat. Cook and stir beef and sausage in the hot skillet until browned and crumbly, 5 to 7 minutes; drain and discard grease. Mix beef and sausage into bean mixture; season with cumin, garlic salt, and chili powder. Reduce heat to medium low, cover stockpot, and cook chili for 30 minutes more. Peppers are optional; chop and add your favorite to spice this chili up. Add cheese and sour cream to your bowl if desired.